Shade Creek Watershed Association, referred to as SCWA (pronounced SQUAW) by it's members, is an all volunteer non-profit organization founded in 1999 to protect and restore water and fish habitat of the Shade Creek Watershed. 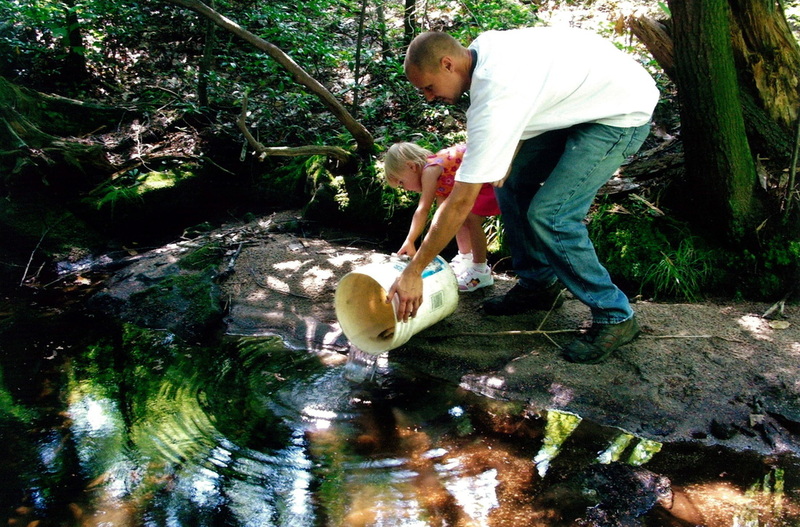 Our primary focus is water monitoring and treatment on Dark Shade Creek and its tributaries. The Shade Creek Watershed is located in Somerset County in the southwestern part of Pennsylvania. Dark Shade Creek joins Clear Shade Creek just north of Central City to form Shade Creek. Thanks to the cleanup and restoration efforts of the Shade Creek Watershed Association in conjunction with the Dark Shade Brownfields Project, native brook trout were reintroduced (shown above) into Shingle Run in 2008. 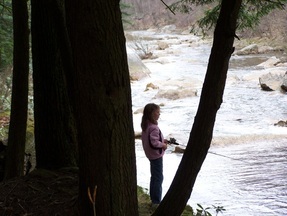 _ Recreational opportunities abound in the watershed. For those who are looking for peace and tranquility there is hiking and fishing. 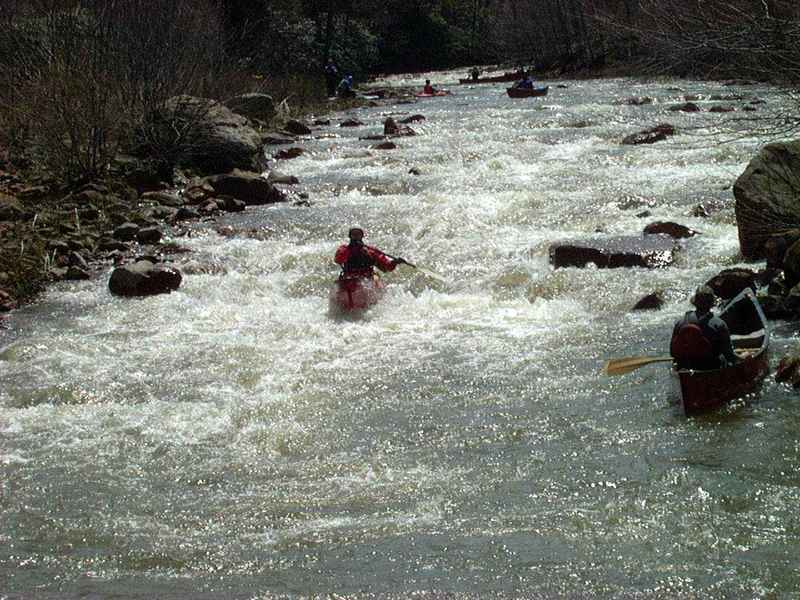 For the more adventurous type, the creeks in the watershed are a popular destination for Kayakers. Hiking is another outdoor activity in the watershed enjoyed by many. 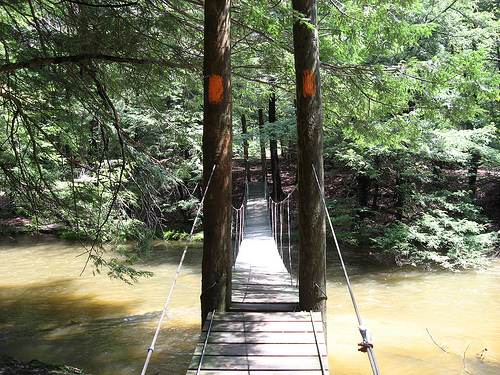 The John P. Saylor trail in Gallitzen State Forest is an 18 mile trail with two loops that crosses Clear Shade Creek by a narrow suspension bridge. In addition to the John P. Saylor trail, there are other trails in Gallitzen State Forest for outdoor enthusiasts. For more information visit the PA DCNR Gallitzen State Forest page. _ Clear Shade Creek, Piney Run, and Beaver Dam Run are all excellent fisheries. They are all listed as Wild Trout Streams by the PA Fish and Boat Commission because of their naturally reproducing populations of trout. Piney Run is also designated as a Wilderness Trout Stream because of its remote, natural, and unspoiled environment. There is a 1 mile section of Clear Shade Creek that is designated fly fishing only. For more information, visit the PA Fish and Boat Commission Website. _ Dark Shade Creek and Clear Shade Creek join to form Shade Creek just North of Central City, PA. People come from all around to kayak sections of those creeks, which have been rated Class III-IV by the Benscreek Canoe Club and as high as Class IV-V by American Whitewater. We've received a grant from DEP for $208,141 for limestone for the Gahagen treatment facility. Check out the story!